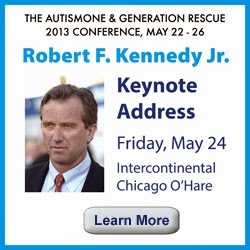 Robert Kennedy is obsessed with the notion that vaccines cause autism. He’s particularly obsessed with the discredited idea that thimerosal, a preservative used in some vaccines, causes autism. Now Kennedy is about to publish a new book on this topic, and he’s promoting it both in the press and, as described in today’s Washington Post, in the halls of Congress. He’s recently had personal meetings with U.S. Senators Barbara Mikulski and Bernie Sanders to try to convince them to take action based on his claims. Why is it that a scientifically unqualified anti-vaccine advocate can get a private audience with a U.S. Senator? Because he’s famous, that’s why. Robert F. Kennedy Jr. is part of the most famous family in America. He’s the nephew of a former president and the son of a former senator and Attorney General, both tragically assassinated in the 1960s. Another uncle, Edward Kennedy, was a U.S. Senator for Massachusetts for decades. He gives hundreds of speeches a year, mostly on environmental issues, and he’s been an influential figure in the environmental movement. Alarming-sounding stuff. The article is full of dramatic claims like this one. The only problem is, it’s all false. As a lawyer, Kennedy should be able to understand this. The science, which Kennedy apparently does not understand, leads to the same conclusion: in study after study, scientists have found no link between thimerosal and autism, or any other kind of neurological disorder. And as RFK Jr knows, thimerosal was removed from childhood vaccines in the U.S. over a decade ago, and the rate of autism diagnosis continued to rise. This fact alone contradicts his major claim. What was shocking to me, the first time I heard Kennedy talk about thimerosal in vaccines, was how absolutely certain he is that he is right. Today's Washington Post article describes a man who remains utterly convinced, despite the mountain of evidence against him. Kennedy has steadfastly refused to admit any errors, ever. As of today, his own website still displays the original article, without even the small corrections that Salon.com had made. He’s been embraced by the anti-vaccine movement: he gave a keynote talk at their annual conference, Autism One (prompting this response from one well-known science blogger), and he even spoke at one of Jenny McCarthy’s “Green Our Vaccines” demonstrations. By ignoring the scientific evidence that shows that thimerosal and vaccines have no link to autism, Robert Kennedy has placed himself firmly in the camp of conspiracy theorists and cranks. He’s also demonstrated breathtaking arrogance. He believes that despite his lack of scientific training, he knows the truth that every scientist who’s studied this issue has missed. Even worse, Kennedy is using his fame to spread anti-vaccine misinformation, which has contributed to an alarming rise in the number of infectious disease outbreaks here in the U.S., including major outbreaks of measles and whooping cough. Though I doubt he will listen to me (he’s ignored everyone else), Kennedy needs to take a hard look at the harm he’s causing to defenseless children, the elderly, and cancer patients, and anyone else with a weak or compromised immune system. His advocacy of bad science will cost lives, if it hasn’t already. When I've heard Kennedy talk about environmental topics, where I agree with him almost completely, I’ve been impressed by his passion and his seeming command of the issues. But having heard him speak about thimerosal and vaccines, I now realize that he’s a dangerous idealogue, willing to distort the truth so thoroughly I can’t believe a word he says. The only solace I can take from today’s Washington Post article is that Senators Mikulski and Sanders don’t believe him either. Both of them brushed him off. Next time, they shouldn’t bother giving him an audience. And yet all six of his kids are vaccinated. If he truly believes there is a danger, why did he vaccinate them? I'm confused on that one. Can a cosmetic lotion turn back time? Not yet.